Interning at the Museum of American Finance has been a great experience. While most summer internships for college students consist of tedious letter filing and coffee runs, we learn first-hand what it takes to run a non-profit museum in the financial capital of the world. In addition to archiving, guiding tours and utilizing social media outlets such as Twitter and Flickr, we take weekly trips to local partner institutions. The interns here have interests across a range of areas including American history, finance and the visual arts. One of the better aspects of the internship is that there is a rotational schedule; we spend two weeks on each project, be it visitor services, archiving, social media or educational development. 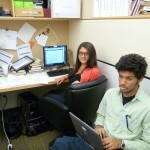 This system allows for collaboration between interns and establishes a sense of community in the office. Despite the freezing temperatures in the library and the archive room, working in the archiving department provides us with a rare inside look into the collections that have been generously donated over the years to the Museum. Sifting through old banknotes, bonds, magazines, stock certificates and photographs, interns quickly learn about the nation’s rich financial history. Archiving has also showed us the process of preserving the collections and its importance in helping to maintain objects in their original state. Everybody looks forward to Thursdays, which is field-trip day. So far, we have been fortunate enough to visit the Federal Reserve Bank, the New York Stock Exchange and the New York Mercantile Exchange. Along with these important financial institutions, we have visited other museums such as the Skyscraper Museum, the National Museum of the American Indian and the New York Public Library. Visiting the museums has given us the chance to see how other institutions maintain and present their collections and exhibits. We found that the NYPL, in particular, had a wide range of collections and a great layout to its exhibits. It has been both helpful and interesting to compare and contrast the MoAF with other museums. The upcoming “Race Around Wall Street” scavenger hunt has been a joint project amongst the interns, and is essentially an amalgamation of the different rotations; researching and assembling this event has involved all of the skills and knowledge the interns gained from their various roles at the Museum. We’ve marked key sites around the Financial District, and, using the financial and historical knowledge acquired from walking tours and field trips, generated sets of challenging clues for the competitors. The skills gained from the interns’ social media rotation have been most beneficial, as we have used Twitter, Facebook and Museum mailing lists to advertise our events. 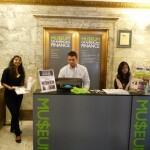 Our work is made even more enjoyable because of the friendly community atmosphere of the Museum. The staff at the Museum is unbelievably accommodating and open to all of our questions and concerns; rather than regarding interns as lowly grunt men or hassles, the staffers have made a concerted effort to include the interns in staff discussions and traditions such as Free Lunch Friday. Such a warm community makes the unpaid work bearable! A small staff ensures that everyone at the Museum gets to know each other, and even employees and interns that leave the Museum come back to visit.